With Turtles, the potty training readiness process is not always clear-cut. Your Turtle conveys her readiness in her behavior and moods, which are sometimes subtle and hard to read. When she pulls away, support and reassure her. When she wants to jump ahead, help her take slow, measured steps forward, but always expect some setbacks. Slow but steady wins this race! This sounds counterintuitive, but leave the bathroom out of the picture for a while. Ease your Turtle in, letting him become comfortable with some of the potty training equipment by making it become part of the environment. 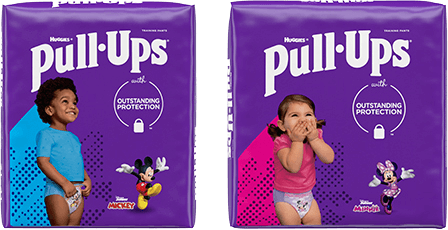 Put Pull-Ups® Training Pants in with your child’s regular diapers long before you expect to use them. Let them be visible and allow your Turtle to notice and inquire about them. Once in a while, take out some Pull-Ups and show your child the character on them. Play peek-a-boo with the character on the Pull-Ups while you’re at the changing table. They have a tendency to hang onto ideas and choices, and you can use this later to your advantage. Take your Turtle to the library or local bookstore and find some books about potty training. Different stories can begin to help your Turtle work through some of the aspects of the process she may be suspicious of or nervous about. Repetition is key, so leave the potty books around the house and allow your Turtle to peruse them as she wishes. Be sure to find her favorite. Having some special favorites for potty time is important to your Turtle and will be increasingly important as you start to move toward the actual potty. Gradually start to phase items into the bathroom, like a potty chair, potty books and wipes. If she starts testing any of them out, don’t get too excited or expect this interest to stick. Follow your Turtle’s lead, and back off immediately if she loses enthusiasm. The last thing you want to do is to kick that Turtle's steel will into gear, which will slow the process down. Casually encourage your Turtle to accompany you to the bathroom while you do your business. Give a low-key description of all the potty goings-on, or just chat about the day’s activities. Turtles often learn by watching and listening, even when you least expect it. The less pressure, the better. Gradually, ask your Turtle to test out sitting on the potty. A lot of Turtles like to do this fully dressed at first. Turtles may also be reluctant to use the adult-size toilet, so you may want to ease them into the process by using a potty chair. With a Turtle, repetition helps. New ideas need to be offered many times, just like we have to offer new kinds of foods many times before children will learn to like them (sometimes 10 to 15 times!). Your Turtle is on the potty training journey with you; he just wants it to be at her pace, not yours. Respect his individuality and the way he asserts his needs, even if it sometimes comes across as resistance. Back off, and let your child find his way forward, with your reassurance and guidance along the way. The worst thing you can do is rush your Turtle. Support his decisions with the comfort of his favorite books, characters and routines.